As we head to press, the 2014 Iowa Legislative Session is in its final hours. This session was an interesting series of election year positioning and limited bipartisan cooperation. Recurring news headlines painted graphic attacks on the operation of state government by first highlighting a multitude of issues involving the Governor, more recently focusing on the Department of Administrative Services and the Secretary of State’s office. The Senate Oversight Committee hearings on alleged “secret settlement agreements” monopolized a great deal of legislator time which has extended the session longer than originally predicted by all involved. Overall, progress was made in regard to issues affecting our industry. One of the highlights this legislative session for the Home Builders Association of Iowa (HBAI) was to further establish ourselves as a partner in the community by building positive relationships with other associations and industry groups. Additionally, our legislative team monitored all introduced bills in order to adequately defend our profession against undesirable changes in the industry. HBA federation membership provides an inside track concerning legislative pitfalls and political responsibility, informing members of movement as it happens at the Capitol. Staying apprised of policy changes is vital to prevent enactment of restrictive legislation that may adversely affect the new home building industry. Taxation: While taxation legislation is more general in nature, the impacts of such policy changes are far reaching, affecting the building industry as well as home owners. The HBAI seeks to educate policy makers and the public on issues that will keep Iowa competitive and ensure future generations have the opportunity of home ownership. Property taxes are always at the top of the list. In addition, bills regarding solar energy tax credits, capital gains tax exemption for the sale of small businesses, and housing tax incentives, among others, comprised the landscape this session. Housing Affordability: Our members are true patriots for housing affordability—they are the small business owners who are under constant attack from unnecessary code changes and increased government regulation. These proposals drive up the cost of home ownership, creating unnecessary burdens for Iowans. At the state level, positive legislative initiatives like the Homebuyer Savings Account proposal that allows Iowans to contribute to a savings vehicle for purchase of a first home and bills that provide incentives for military veterans align with the HBAI’s mission to provide homeownership opportunities to all Iowans. Additionally, our efforts with the National Association of Home Builders resulted in a savings of $6,200 per housing start in 2013. Statute of Limitations: Attempts to limit the discovery period in a property lawsuit from five years to three years were well received by the legislature this session. The proposed reduction benefits both consumers and home builders by encouraging mitigation of a problem much earlier than what is currently happening today. By starting the process earlier the overall damage is reduced, thereby reducing repair time and insurance rates. Collaboration: We enthusiastically keep ahead of safety, energy, and health issues. 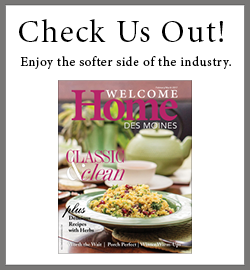 As the industry evolves we prefer to collaborate and work within the market rather than constantly change Iowa Code. Window fall protection, which has been in the news and in front of the legislature for the past few years, is an example of collaboration at work. The HBAI partnered with Blank Children’s Hospital, the Iowa Chapter of the Academy of Pediatrics, the Hannah Geneser Foundation, and Governor Branstad to promote child safety.